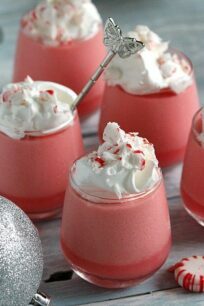 Candy Cane Raspberry Dessert Shots topped with whipped cream are no bake, gluten free, creamy and easy to make with only 4 ingredients. This Candy Cane dessert is so pretty and delicious, it screams holidays all over it. I also have a Candy Cane Chocolate Martini to pair with it. 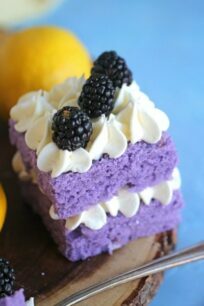 I am bringing you something sweet and delicious today, since its Christmas week. 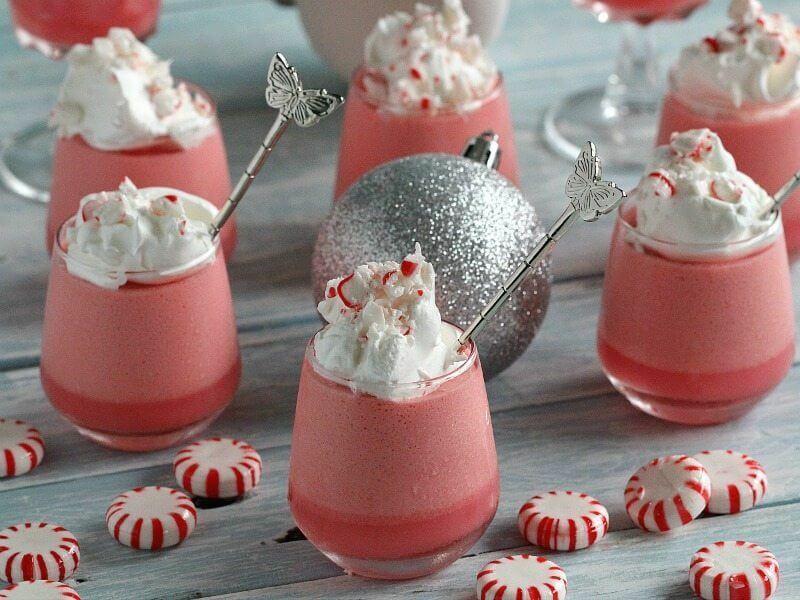 If you need last minute party dessert ideas, look no further than these Candy Cane Raspberry Dessert Shots that are creamy, delicious and festive. These Candy Cane Raspberry Dessert Shots will add a pop of color to your dessert table. Also, they come together in minutes. The waiting game for them to settle in the fridge is the toughest part. 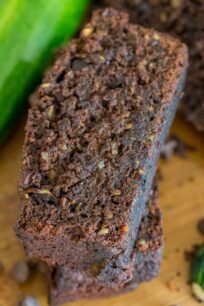 With 4 ingredients only, technically 3 if you don’t count water, and being no bake, it takes just a few minutes to mix everything and make this amazing and very good looking dessert. These shots are non alcoholic, so feel free to let the kiddos have some. In addition, The flavors are amazing, sweet and aromatic raspberry with refreshing mint from the candy cane. 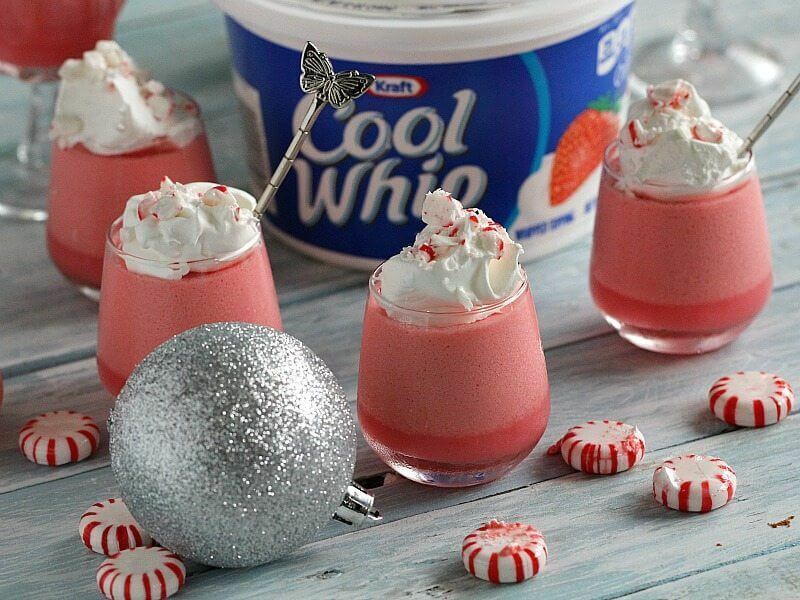 So all you have to do is mix, Raspberry JELL-O with Candy Cane and Cool Whip to get a smooth and luxurious dessert. 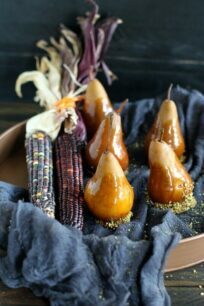 Firstly, they are easy and delicious dessert that will help you celebrate the season easy and chic! Also, they are creamy and sweet, making them the perfect dessert for the holidays. In addition, they are silky and unbelievably refreshing,. 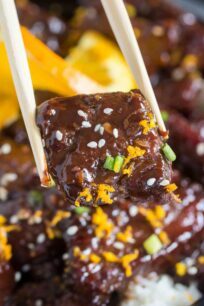 Perfect for a crowd and can be made in advance. 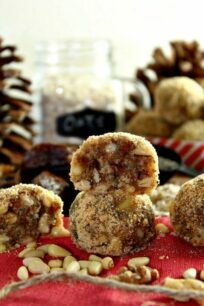 Similarly, they are no bake and gluten free, and are the perfect mini treat. How long does the Candy Cane Raspberry Dessert Shots take to set? Once you cover them with whipped cream, leave to set in the fridge for about two hours. 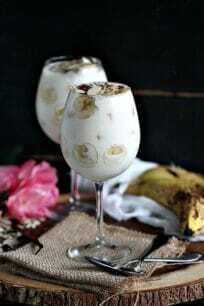 It is best for this dessert to settle for few hours so it absorbs the cream and becomes moister. 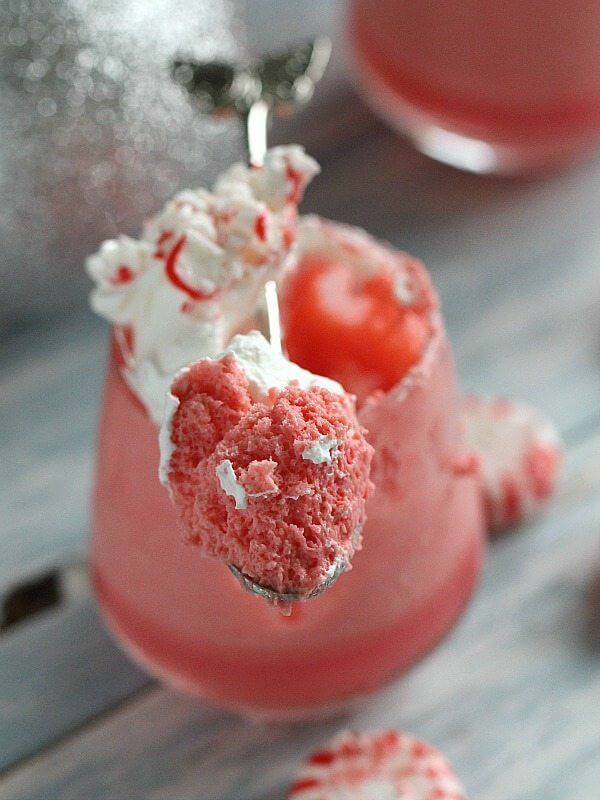 Can you store the Candy Cane Raspberry Dessert Shots? Leftover shots can be stored. 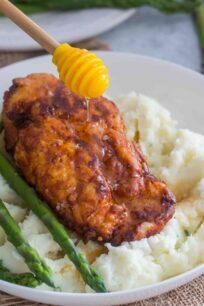 Loosely covered in the fridge, for up to 3 days. After which it will still be edible but the shots will be very soggy and the cream will become looser, soaking up the whipped cream and syrup. Best to eat them within 2-3 days. Add boiling water to combined gelatin mix and 1/3 cup crushed candy cane in medium bowl; stir 2 min. or until gelatin mix is completely dissolved and candy is melted. Reserve ½ cup of Cool Whip. Add remaining Cool Whip to gelatin mixture; whisk until blended. 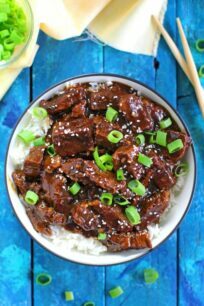 Spoon into 12 (2-oz.) shot glasses. Refrigerate 2 hours or until firm. Top with remaining Cool Whip and crushed candy cane just before serving. Oh. My. God. 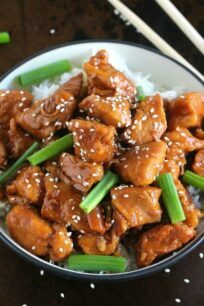 These look amazing, Katalina!